Starbucks online is offering 20% off select single serve coffee on now! 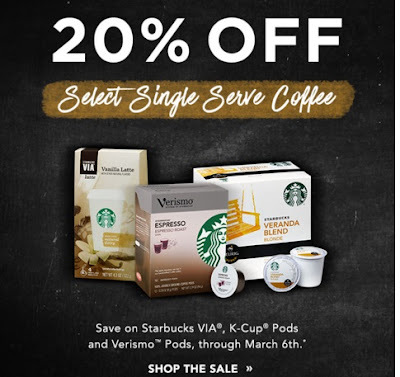 This promotion applies to Starbucks VIA, K-Cup pods and Verismo pods now through March 6, 2016. While quantities last. No promo code is needed, but if you sign up for their newsletter you can get a 10% off code to use on your order! Click here to browse Starbucks Canada.